The lovely Athénée Théâtre Louis Jouvet has been celebrating the 50th anniversary of the death in 1951 of its eponymous founder by mounting a series of plays that received their first productions under Jouvet. One of the best-known of these is LA FOLLE DE CHAILLOT by Jean Giraudoux first produced at the Athénée in 1945. This new production by the Théâtre du Campagnol/CDN is most notable for its spectacular sets and costumes. Director François Rancillac has decided to treat as a fairy tale Giraudoux's story of an eccentric who manages to defeat a cadre of capitalists in their attempt to dig up the monuments of Paris in search of oil. Set designer Raymond Sarti and costume designer Sabine Siegwalt set the first act entirely in black from the ministers’ trenchcoats, to the furniture to the trees themselves, which we come to see look just like oil derricks covered in black cloth. The only colour arrives as various of the real people of Paris--a dishwasher, a singer, a flower-seller, a deaf-mute, a rag-picker--burst one by one through doors hidden in the black back wall. 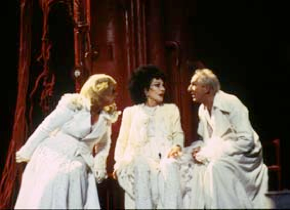 The woman they rally around is Aurélie, the Madwoman of Chaillot (Judith Magre), who is clad entirely in a bright white, impossibly frilly costume. The décor for Act 2, set in Aurélie's living quarters below the streets of Paris is entirely in red. If the trees above ground seems to look like machines, the reverse is true in Aurélie's world where the various pipes that traverse her space have begun to sprout twigs and branches. The blackness and straight lines that characterize the ministers contrast with the whiteness and curved lines of Aurélie and her companion madmen. This makes for a visually exciting production but the difficulty is that this radical split of black versus white tends to sanitize the role of Aurélie and rid her of any complexity. This Aurélie, addressed as "comtesse" actually looks like a countess. As acted by Magre, Aurélie at no point suggests a madwoman much less a bag-lady. Aurélie's speech to the would-be suicide Pierre to convince him that life is worth living is very effective, but far too much of the time Magre struck me as the kind of star actress who no longer bothers to play a character. Without the contrast between how Aurélie looks and acts, we lose the sense of poignancy that otherwise makes this character so fascinating. The actors who surround Magre are all excellent, most notably Philippe Lehembre as both the evil Baron and the indecisive Folle de St.-Sulpice, Jean-Claude Penchenat as the proud rag-picker, Thierry Paret as a soulful Pierre and Mélanie Leray as the delightful Irma the Dishwasher in love with Pierre. Yet ultimately, I felt that more effort had been expended in giving the play its snazzy look than in mining the text for meaning. LA FOLLE DE CHAILLOT plays at the Athénée Théâtre Louis Jouvet (33.01.53.05.19.19) until February 16, 2002. Photo: Marie-Françoise Audollent, Judith Magre and Philippe Lehembre. ©2002.